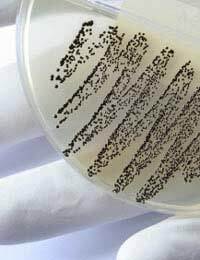 Antibiotic resistance developed within a few years of the first antibiotic coming into widespread use in World War II. It is now a global problem. People all over the world, including in the industrialised countries where there are stringent regulations and highly trained medical professionals, continue to misuse antibiotics. Several key strategies will be required to prevent further antibiotic resistance developing and to stop the spread of strains that are already antibiotic resistant. Around 87 per cent of the antibiotics used in veterinary medicine currently go to farm animals. This creates opportunities for bacteria present in farm animals to become resistant to antibiotics, and for these bacteria to pass on their antibiotic resistance genes to some of the bacteria that infect humans. It is also a fear that antibiotic residues in food will provide low levels of antibiotics that could further generate antibiotic resistance in human bacterial pathogens. Using antibiotics to prevent infections needs to stop, and treatment with antibiotics should be reserved for serious infections. In the USA, an unusual loophole relating to animal treatment with antibiotics was reported in 2008. Pet shops in the USA that sell fish are also allowed to sell antibiotics to treat fish diseases. These are human antibiotics and can be bought from pet shops without a prescription. Being able to buy broad spectrum antibiotics freely in pet shops encourages people to buy them for their own use and is a highly dangerous practice that should be stopped through legislation. Many dentists prescribe antibiotics unnecessarily and this has contributed to the antibiotic resistance seen in bacteria that causes tooth abscesses. Twenty years ago, only 5 per cent of all dental abscesses were due to antibiotic resistant bacteria but by the mid 1990s it was over 50 per cent. The figure today is probably even higher but no official data has yet been made available. Dentists should ensure that they only prescribe antibiotics when necessary and should encourage patients to complete the full course. There is no doubt that antibiotics have saved many lives since 1940 but they have also been used millions of times when they were not needed. Recent studies have shown that GPs in the UK frequently feel under pressure to prescribe antibiotics, even when they know that it is inappropriate. There is some evidence that they put a false diagnosis in notes so that their prescription will not be questioned. Although it is the responsibility of a GP to prescribe antibiotics sensibly, it is also up to the people who consult GPs to be aware of the problem of antibiotic resistance. Arguing heatedly with a GP when he or she advises that antibiotics are not indicated should be avoided. Part of the problem that arises in the GP’s surgery stems from the great misunderstandings that exist in the mind of the general public. Very few people understand exactly what antibiotic resistance is, or the difference between bacteria and viruses. Many people assume that a common cold should be treated by antibiotics, not realising that colds are caused by viruses not bacteria. Governments around the world need to take steps to ensure that the general population is better educated about antibiotics. There are some projects to teach school children about the sensible and safe use of antibiotics but targeted campaigns aimed at older people would also be extremely valuable. It is extremely easy to buy antibiotics over the Internet from countries that do not require a prescription for their sale. This is a great temptation to people in countries where prescriptions are required, but is another very dangerous practice. Not only can using antibiotics incorrectly generate resistance, there are no guarantees of the quality of the drug supplied. It may be a counterfeit product, with no active ingredient. Worse still, it could contain contaminants and toxins and cause illness or even death. The next obvious step from abolishing Internet sales would be to put international pressure on countries who still do allow antibiotics to be bought without prescription. Better control of antibiotic use needs to be implemented worldwide for the battle against antibiotic resistance to even have a chance of being won.